The site of the Coudersport Consistory house is on the location of the first brick store building in Potter County. The store was constructed in 1853 by Collins Smith who later sold the property to Isaac Benson. Mr. Benson was one of the most progressive and ambitious citizens during the early history of Coudersport. He was born in Waterford, PA in 1817, studied there and was admitted to the bar in Warren in 1844. The following year he moved to Coudersport, looking for a wider field for his abilities. His decision to relocate was a wise one for himself, as his every move seemed to meet with success. It was also fortunate for the community where he became a devoted citizen to its interests. In 1845, Coudersport has not yet been chartered as a borough. When it was chartered in 1848, Isaac Benson was elected to the office of Burgess, a position which he held for two terms. (Burgess today would be mayor). In 1856 Mr. Benson was elected to the State Legislature and in 1859 to the State Senate. During the Civil War he was appointed Paymaster by Mr. Lincoln but because of his law practice and business interests he declined the position. December 1857 saw the marriage of Mr. Benson to Eugenia L. Stebbins. To his union one child, a son James was born. Mr. Benson began construction of his new three story, brick house which was one of the most elaborate dwellings in the northern tier in 1887. The family moved to their new quarters during the following year. The Benson mansion located on the banks of the Allegheny River was not only majestic in its exterior appearance; the interior also gave the visitor a feeling of elegance. Each room was trimmed in a different highly polished wood. As one entered the 14 foot by 30 foot hallway by the front door, several outstanding examples of Victorian era architecture came into view. The Italian marble fireplace on the right was capped with an ornate gold framed mirror, and the golden oak stairway at the end of the hall with its two landings, was built with grandeur. On the second landing is a beautiful leaded colored window. The statuary on the newel post was given by the Buffalo Consistory in 1936. On the left as you enter was the sitting room or library. This room which is presently used by the accommodations committee is finished in polished cherry and also contains a fireplace. Next to the library was the dining room which is trimmed with antique oak. All of the windows were covered with louvered shutters. Doors from this room led to the library, hallway and the kitchen which was located at the back of the building. The kitchen was also trimmed in quartered oak. The parlor, now the registration room, was located to the right of the entrance. Here the fancy woodwork is of polished sycamore. At onetime there were windows on either side of the marble fireplace. Next to the parlor was the music room with a fireplace topped by a marble mantle. The room always contained a grand piano, is trimmed in butternut. Upstairs the hallway is of golden oak and has three large windows around the area where Mrs. Benson had her sewing room. A conservatory was built outside these windows. The first room on the left at the head of the stairs was the master bedroom; trim is of white sugar pine. Next to this was the guest room with woodwork of polished white ash. To the right of the hall in front was a large bedroom containing a fireplace. Both the fireplace and the room have a black birch trim. Double doors lead from this room to what was another bedroom trimmed in bird’s-eye maple. Two rooms and a bath were located across the back of the house, above the kitchen. One of these was for the maid and the other for the gardener. The third floor has a 30 by 30 foot open space. This area was first used by the Masons as a billiard room. Mr. Benson died on March 11, 1894. Mrs. Benson lived in the house until the property, consisting of 27 acres and the mansion was transferred to the Lodge of Perfection on March 6, 1912. On April 6 of the following year, ground was broken for the addition of a 62 foot by 134 foot Cathedral Building. The cornerstone for the new Tudor Gothic structure was put in place at high twelve on July 21, 1913. 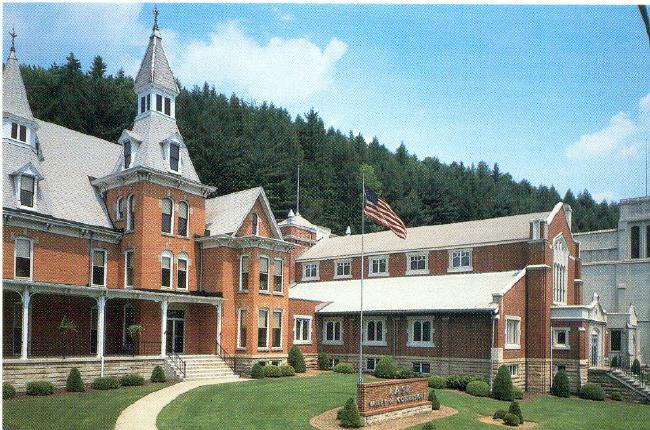 This beautiful new facility served the Consistory until 1929 when the large auditorium and adjoining rooms were added, giving the Valley of Coudersport the very pleasant and adequate facility which we enjoy today. From the fellowship of the facilities to the fine mountain scenery, you will find something very special about the Valley of Coudersport. Against the dramatic backdrop of Pennsylvania's famed Potter County ~ known to many as God's Country ~ the Valley of Coudersport is the perfect setting for both the pageantry and the quiet thinking that are necessary parts of the progression through the degrees of Scottish Rite Masonry. Like other Scottish Rite Bodies, the Coudersport Consistory uses stage productions to emphasize the moral teachings and philosophies of its degrees. What sets Coudersport apart is the quality of both the facility and the productions. Here you will find: magnificent costumes, a 51' x 52' stage equal to any on Broadway, an auditorium with 1,132 soft red cushioned seats, excellent acoustics, and a pipe organ renowned for the purity and range of its voice. The Valley of Coudersport has its own special brand of hospitality, too. The 700 seat dining room is just famous for excellent meals and uncommonly efficient service. The lounge is very well appointed, and the Victorian porch, with its rocking chairs and hanging plants is the perfect spot for quiet reflection and warm fellowship.